Nueva Epoca Women's Cosima - 3'' (7.0 cm) Stiletto Heel, 9 M US (6 UK) by Nueva Epoca at SCRHI. SKU: NE-Cosima-70-9. Hurry! Limited time offer. Offer valid only while supplies last. Sophisticated and fantastically comfortable Nueva Epoca Cosmina dance shoe by Werner Kern in exclusive red goatskin suede with black suede straps. 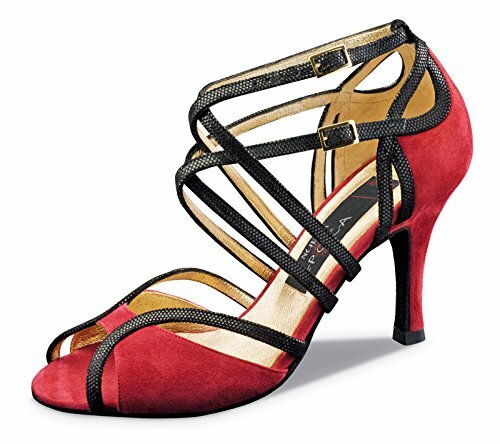 Sophisticated and fantastically comfortable Nueva Epoca Cosmina dance shoe by Werner Kern in exclusive red goatskin suede with black suede straps. With the enticing design of the front in connection with the individually adjustable crossed instep and heel straps, this shoe offers a perfect, comfortable and stable fit. If you have any questions about this product by Nueva Epoca, contact us by completing and submitting the form below. If you are looking for a specif part number, please include it with your message.